يشكل فندق Litchfield Motel بموقعه الممتاز في قلب هذه المنطقة الرائعة كنقطة انطلاق ممتازة لاستكشاف المدينة. يقع الفندق على بعد 100. Km من مركز المدينة، ويؤمن الوصول إلى أهم مراكز المدينة. يوفر العقار بفضل موقعة الجيد وصولاً سهلاً إلى أهم معالم المدينة.
. يعرف Golden Chain بالمستوى الراقي لخدماته ولباقة موظفيه، وهذا ما ستجده في Litchfield Motel. هذه بعض الخدمات الموجودة في هذا الفندق: مرافق مخصصة لذوي الاحتياجات الخاصة, واي فاي في المناطق العامة, صف السيارات, غرفة عائلية, مطعم. بالإضافة لهذا، تتضمن كل غرف الضيوف مجموعة واسعة من وسائل الراحة . بعض الغرف توفر حتى تلفزيون بشاشة مسطحة, غرف لغير المدخنين, مكيف هواء, مكتب, شرفة/ تراس لإرضاء أكثر الضيوف تطلبًا. يقدم الفندق مجموعة واسعة من وسائل الراحة المتنوعة، كمثل: حمام سباحة خارجي, حديقة. مهما كانت أسبابك لزيارة المدينة، فإن Litchfield Motel هو الخيار الأفضل لإقامة مثيرة وممتعة. In November the tourist trade and the motel have wound back significantly so it is difficult to give an an accurate assessment in most areas. I had a number of maintenance issues which were attended to promptly and efficiently. The motel surrounds were neat and tidy and I can could only imagine what a busy place it would be during the dry season. I enjoyed my stay. This is a good place to stay in Batchelor, on the road to Litchfield NP. The motel is a bit dated, but has friendly and helpful staff, a nice pool and continental breakfast included. Walking distance from the centre of Batchelor for dinner. It may not come with all the bells and whistles of a 5 star resort however, the friendly efficient team go over and beyond to do their job in customer service. Some how, our booking was registered for the day prior to our arrival - not sure if this something I did in my enthusiasm in booking our trip around the Top End?? Arriving a day late, Tania welcomed us with a smile and went about juggling reservations to make it work for us. A BIG SHOUT of THANKS to Tania who not only went out of her way to fit us in, but then gave us the added bonus of an upgraded room! The location was great to explore the National Park. The facilities were clean and the beds comfy … what more do you want? Asked specifically about what was in the root vegetables, ie no beetroot was told definitely none. Got the meal and 3 big chunks of beetroot bleeding over whole plate. Returned to Ask for replacement got attitude. The motel was in an excellent location with a huge room and all that we needed. Pluses... Located in Batchelor, service station, small shop with snacks and essentials, pool, big rooms, pub attached, food served everyday except Sun and Mon, clean rooms. Minuses... Dated but in good condition for age. We paid dearly for this accommodation compared to others we had traveling south from Darwin and the three customers including us may be cause for the owners to re evaluate their charges. Having been to this area long ago I was keen to re visit and we found this magnificent property looking worn but with obvious work going on. We had no problem with our accommodation as our room was large,clean and acceptable with the bar area and restaurant a pleasant surprise and the staff accommodating. We came along, not asking for much, expecting little and getting just that! A great deal of effort and a big injection of resourcing needs to go into this very tired place. Dirty, worn and awful! Stains on pillowcase - BIG no no, crumbs on benches and dirty shower. Honestly, we weren't asking for much - couldn't get out of there quick enough in the morning. I am concerned for the reputation of Australian accommodation as this place was poor on so many levels. And we are being kind to the new operators! Hotel was comfortable with all the amenities you require after a day exploring Litchfield Park, airconditioning, clean swimming pool, bar fridge, friendly staff, connected to bar/bistro outside. The Staff helpfulness. The asscoaited bottle shop. The staff. Much better staying here & relaxing in the pool & gardens than travelling back to gardens. A really quiet motel in a really quiet town. Motel is ok. Room is spacious n clean. Check-in is an absolute 2pm and after .. Not before.. No exception. Do not arrive early. Bring your own fun. The stay was good. We only stayed one night no hassles. In ground floor so smoke from other patrons seeped into room. Free the caged cockatoos!! An older style hotel kept really well. 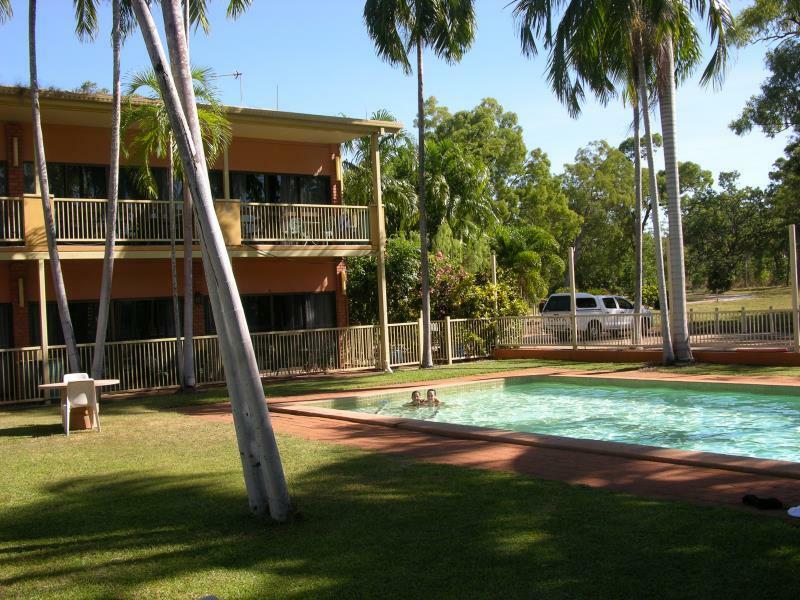 Location in a bush setting in a quiet area, choice of a public bar or a restaurant to eat at, great pool and all kept clean and inviting. Great hotel. recommend it. Close to Litchfield National Park. Average country motel rather run down; old managers not reinvesting in the premises; broken washing machines all over the resort; no kids play area; surly manager just focused on his pokies. Hotel is well located for the Litchfield Park. The pool is well maintained and of adequate size. There is a restaurant but we found the pizza somewhat substandard. Otherwise this hotel was reasonable value for the price.